Indices sold off with a relatively heavy volume today before rallying back to close well into the green. 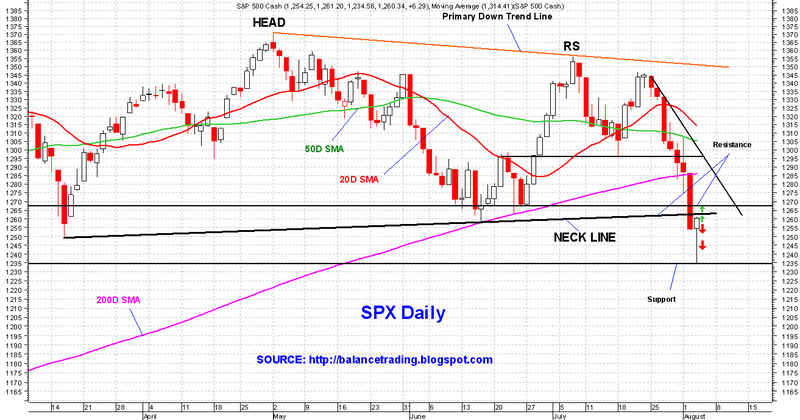 SPX back tested its H&S Neckline and closed slightly below it. The momentum from the rally today very likely pushes indices higher early tomorrow (ideal place to add more shorts), but odds are good that Big Money sells heavily into that rally. I expect indices to sell off tomorrow and possibly test their today's lows. A close tomorrow below today's lows would be very bearish and would leave indices at extreme oversold levels, hence increasing the probability of a severe correction or a crash. In my opinion, Big Money would not allow indices reach extreme oversold conditions. 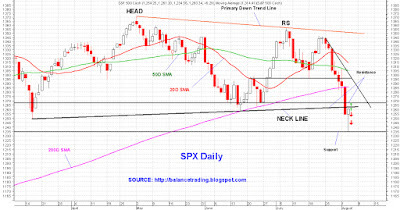 Indices would be back stopped via their future contracts to stop any possible capitulations and to keep prices stable. Price stability is critical for Big Money not only as he unwinds its long equity positions, but also as he adds new short positions as decline continues. The Chinese water torture that started on May 2 will continue so long as the Fed sits on the sideline and does not intervene via QE-III.